english name "European Star-Footed Amanita"
1. Amanita asteropus, southwestern France. Fruiting body dimensions are taken from Traverso (1999). All parts of the fruiting body bruise/stain reddish or orangish brown when damaged. The cap of A. asteropus is 60 - 120 mm wide and ranges from cream with a butter yellow tint in the center to ivory white to pale butter yellow. When moist it is slightly viscid. At first the cap is bell-shaped, then convex, and finally planar with an umbo. It can be convex in age. The volva is often absent from the cap but sometimes appears as submembranous, pale-ochraceous plaques. The gills are free and white at first, then cream. 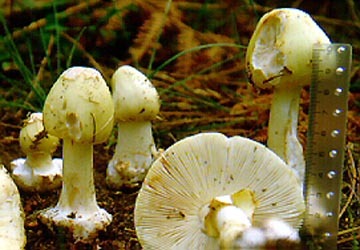 The stem of A. asteropus is 100 - 150 × 15 - 20 mm, white to pale yellow, and bears a superior annulus that is white above and may be pale yellow below. Some sources say that the annulus is sometimes quite fragile. The stem's bulb is roughly hemispherical and split vertically on the sides giving it a star-shaped cross-section when cut perpendicular to the axis of the stem. The volva is white to yellowish at first and is fragile and easily left in the substrate when the species is collected. Amanita asteropus (especially in the base of the stem) has the odor of radish or raw potato when young. It has no appreciable taste. 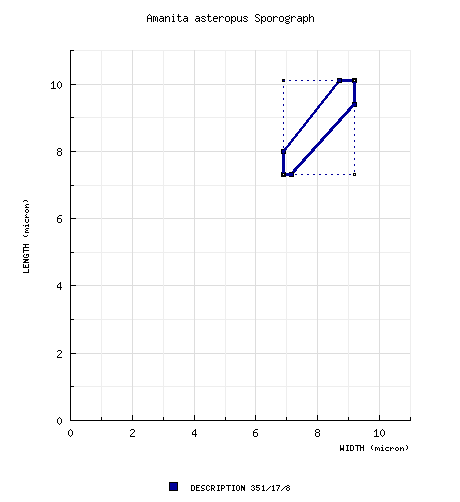 The white spores measure (6.8-) 7.3 - 10.1 (-14.5) × (6.0-) 6.9 - 9.2 (-11.6) µm and are globose to subglobose (infrequently broadly ellipsoid or ellipsoid) and amyloid. Clamps are absent from the bases of basidia. The species was originally described from France (Gironde) and is known from southern Europe. Oddly, neither author gave macroscopic dimensions for any part of the fruiting body. 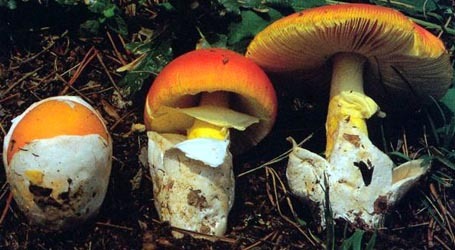 Amanita asteropus is associated with oak, either in pure groves or in mixed forests. Its segregation from A. aestivalis Singer was demonstrated by Tulloss and Massart (1998). The species differ at least in the color of the fruiting body and in their reactions to macrochemical tests (e.g., when 1% paracresol solution is applied to a cross-section of the fruiting body of A. aestivalis there is no reaction; but when the same is done to A. asteropus, the entire cross-section becomes red-brown—positive for the presence of tyrosinase). Another species to compare with A. asteropus is A. brunnescens G. F. Atk. Photo courtesy of Francis Massart (southern France). author Sabo ex Romagn. 1982. Bull. Trimestriel Soc. Myc. France 98(2): 165.
revisions partial: Massart, F. 1964. Proc.-verb. Soc. Linn. Bordeaux 101: 71.
partial: Tulloss and F. Massart. 1998. Doc. Mycol. 28(109-110): 73-76. Neville and Poumarat. 2004. Fungi Europaei 9: 780-786.
selected illustrations F. Massart. 1980. Bull. Sect. Mycol. Soc. Linn. Bordeaux 8: 8, 10-12, figs. 1-7, 9-11. F. Massart. 1984. Approche Gen. Amanita: 69, pl. 16. F. Massart. 1986a. Boll. Assoc. Micol. ed Ecol. Rom. 3(8-9): 39, 41, 43, 46-47, color plate & figs. 1-5, 7-8. F. Massart. 1987. Bull. Soc. Linn. Bordeaux 15: 10, pl. 3. F. Massart. 1990. Connaître Champ. : 11. The following material not directly from the protolog of the present taxon and not cited as the work of another researcher is based upon original research by R. E. Tulloss. pileus from protolog: ivory, always spotted with wine-colored or reddish or brown in center, at first obtusely conic, then expanded with rounded or (at length) flattened umbo; context thick, white except sometimes slightly pinkish gray under pileipellis; margin not described; universal veil sometimes present as one or several plaques, submembranous, whitish or ochraceous. odor/taste from protolog: Odor like that of A. mappa, but weaker. Taste not recorded. basidia from protolog: 47 - 52 × 11 - 13 (-15) μm. lamella edge tissue note described. composite from all material revised by RET: [351/17/8] (6.8-) 7.3 - 10.1 (-14.5) × (6.0-) 6.9 - 9.2 (-11.6) µm, (L = (7.6-) 8.2 - 9.1 (-9.3) µm; L’ = 8.6 µm; W = (7.0-) 7.6 - 8.4 (-8.6) µm; W’ = 8.0 µm; Q = (1.0-) 1.02 - 1.16 (-1.34); Q = (1.05-) 1.07 - 1.10; Q’ = 1.08). ecology from protolog: In sandy forest or in calcareous clay. With Quercus. RET: Under Quercus robur or in forest with Quercus. material examined from protolog: FRANCE: UNKN. DÉP.—unkn. loc., s.d., unkn. coll. s.n. [H. Romagnesi 57.310] (holotype, in herb. H. Romagnesi => PC). RET: FRANCE: GIRONDE—Aiguemortes-les-Graves, 7.vii.1993 Francis Massart 93055 (in herb. Massart; RET 259-4); La Brède, Château La Sauque, 27.vi.1997 Francis Massart 97031 (in herb. Massart; RET 262-2); Gradignan, Mandavit [24 m elev. ], 7.vii.1993 F. Massart 93054 (in herb. Massart; RET 259-5), vii.1996 F.Massart 96021 (in herb. Massart; RET 259-6, nrITS seq'd. ), 27.vi.1997 Francis Massart 97031 (RET 262-2), 30.vi.1997 F. Massart 97032 (in herb. Massart; RET 262-3), vii.2000 F. Massart 20005 (in herb. Massart; RET 342-3, nrITS seq'd.). Médoc, Segonne, 2.viii.1958 F. Massart 58-01 (RET 020-8), F. Massart 58001 (in herb. Massart; RET 259-7). INDRE-ET-LOIRE—Forêt de Russy, Carrefour de l’Étoile, 6.ix.2015 Pierre-Arthur Moreau 15090601 (RET 730-2, nrITS & nrLSU seq'd.). LES LANDES—Mont de Marsan, 15.viii.1991 F. Massart 91 AI 1/7 (RET 032-5). photo M. Francis Massart - (1) southwestern France. provisionally identified as: Amanita asteropus Sabo ex Romagn.